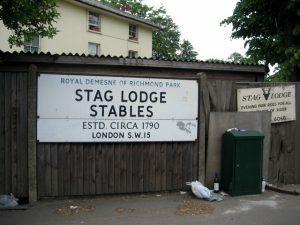 Following instructions from a client a survey was scheduled for one of our Property Care Association (PCA) qualified, specialist, damp and timber surveyors to carry out a damp survey at Stag Lodge Stables, Roehampton Vale, on the edge of Richmond Park. A thorough survey was carried out and moisture readings were taken to the surface of the damp walls, using a calibrated damp meter in measure mode and a thermal imaging camera. In our surveyors opinion the damp was being caused by the original old walls not being constructed with a damp proof course, which was allowing damp to rise from the ground by capillary action and rainwater penetration from a leaking roof. Safe access was made onto the roof, where an inspection confirmed it was leaking. Our detailed report, images and recommendations were sent to our client who instructed us to commence the repairs. Our experienced and trained operatives first repaired the leaking roof by removing some of the roof slates and replacing the roof valley with new code five lead. The roof slates were the refitted and replaced as required. Inside the property the damp wall plaster was removed and all rubble was bagged up and taken to a designated place for disposal. A chosen mortar joint at the base of the walls was pattern drilled, then cleared of dust, prior to injecting with a Silane/Siloxane cream damp proof course solution at the approved rates. The walls were then prepared and replastered in accordance with our damp proofing specification to complete the system. New skirting boards were fitted and primed ready for decorating. The damp proofing and roof repair carried out at Roehampton is covered by our 20 Year and 5 Year Guarantee respectively and the damp proofing guarantee is protected by Guarantee Protection Insurance (GPI). All damp proofing is specialist work and should not be confused with normal building work. Tapco HomeDry are an established, reputable company and a 5 star Which Trusted Trader, so for damp proofing, water damage or dry rot repair, call us first.